Product #21281 | SKU 311962 | 0.0 (no ratings yet) Thanks for your rating! 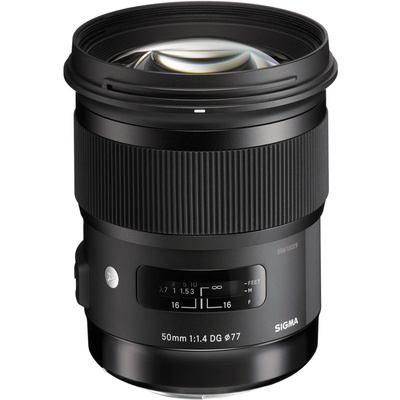 The Sony A mount Sigma 50mm f/1.4 DG HSM Lens is a fast standard-length prime designed to achieve high optical performance through the incorporation of both three Special Low Dispersion glass elements and one moulded glass aspherical element. These elements, coupled with an advanced optical design, work to minimise sagittal coma flare and chromatic aberrations in order to provide high image sharpness and clarity. The lens' large diameter and floating system also help to correct for vignetting to ensure maintained peripheral brightness. A Super Multi Coating has been applied to lens elements, too, to reduce flare and ghosting for higher contrast and colour fidelity. A Hyper Sonic AF Motor, along with an optimised AF algorithm, produces quiet, smooth, and fast autofocus performance that benefits this lens' use in a wide variety of situations. This AF motor also permits full-time manual focusing control for refined precision by simply turning the focus ring at any time. This lens has been designed using an advanced optical structure to achieve both high resolution and sharpness along with an aesthetic out-of-focus quality for greater subject separation. A moulded glass aspherical element corrects for sagittal coma flare and enables full use of the fast f/1.4 maximum aperture with maintained sharpness and clarity. This design also works to minimise vignetting, colour blur, and other distortions help to produce natural and pleasing bokeh for selective focus and shallow depth of field techniques. By reducing these aberrations, this lens is also well-suited to astrophotography or other situations with point-light sources due to its ability to suppress blur near the edges of the frame. In designing the lens with a large 85.4mm diameter, and placing the widest elements within the front group, greater peripheral brightness is more easily attained when working with larger apertures. This design also lends itself to minimising vignetting throughout the aperture range for greater clarity and detail across the image frame. A Super Multi-Layer Coating has been applied to lens elements in order to minimise lens flare and ghosting and contribute to producing contrast-rich and colour-neutral imagery, even in backlit conditions. By employing a floating system, the distance between glass elements is adjusted during focusing in order to limit the amount of lens movement required when shooting. This floating system helps to realise a minimum focusing distance of 40 cm with a maximum magnification of 1:5.6. Additionally, this design also contributes to high detail rendering capabilities throughout the entire focusing range. The integrated HSM (Hyper Sonic Motor) realises quick and quiet autofocusing, which is further complemented by an optimised AF algorithm to produce smoother focusing performance. The HSM also permits full-time manual focus control simply by rotating the focus ring at any time.